On to the recipe though – so what’s a “bachkoutou” I hear you asking? 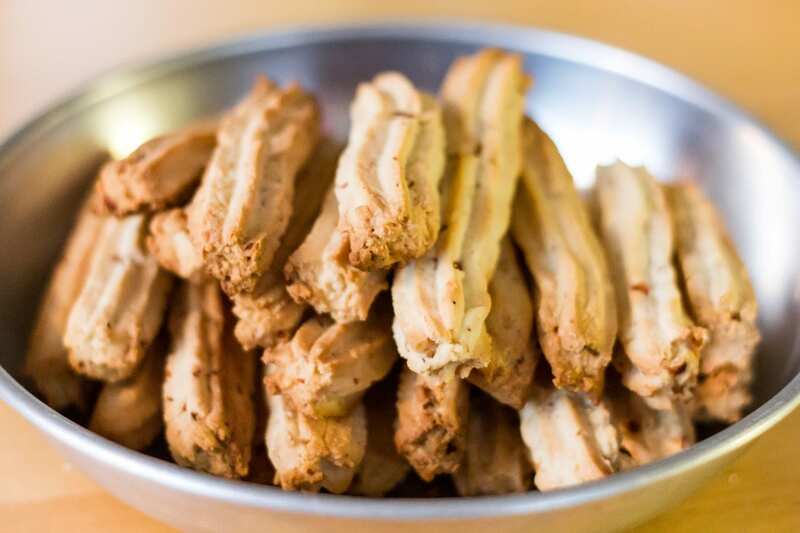 Bachkoutou, sometimes written “bechkoutou” are my newest discovery, and fast making their way up to the top of my list of favourite biscuits. 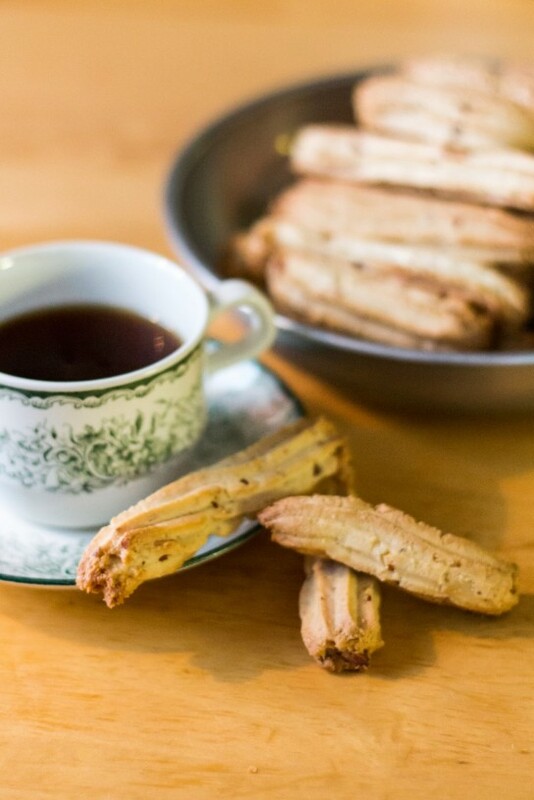 They’re a Tunisian biscuit, traditionally made for Eid, but they can equally be made any time. They’re often made in large batches (and by large I actually mean “huge”) by households, and then taken to a local bakery for baking. As a result, creating a batch of bachkoutou can literally be almost a day’s work, involving several family members, and as such it’s often something reserved for special occasions. Once at the bakery, they’ll be placed into the giant ovens once all the bread has been baked for the day and baked to perfection. Sadly this kind of baking environment isn’t that easy to recreate at home. As a result, bachkoutou have a tendency to be tricky to perfect. However, my attempts still yielded a delicious, incredibly moreish biscuit, so I hope you’ll take my word for it and give them a try! When my mother-in-law told me that these were her favourite biscuits of all time I will admit I had my misgivings. How could they possibly be that good? I’ll say this as well – once they were baked and I’d had a couple, I still didn’t see what the fuss was about. But then I had a few more. And a few more. And a few more… and then it hit me: this innocent-looking little cookie is actually incredibly good. It’s got crunch, it’s got crispness, it’s not too sweet (in fact it’s not really sweet at all, but has just enough sugar to be awesome! 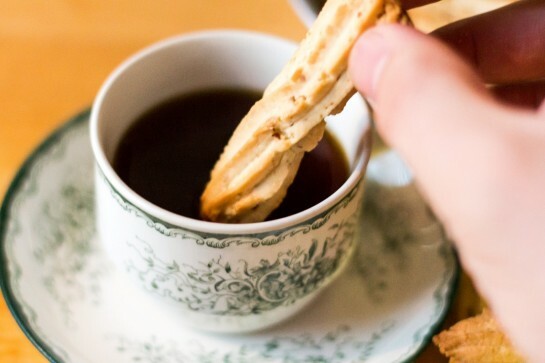 ), and if you pair them up with a cup of coffee you can easily wade through a great quantity of them in no time at all. A couple of notes on the creation of these. Nuts, I would say, are required. You don’t have to add them I suppose, but they won’t be the same if you skip them. Conversely, while I used almonds, you can equally use cashews, pistachios, hazelnuts… the choice is yours. As for the construction of these – they’re often made in a meat grinder. If you have one, and you have a star template for the place where the meat comes out (great accurate terminology there!) then use that and simply grind away, cutting off lengths. If you don’t have one, like me, then you can also manually push the dough through a large, fluted piping nozzle. This is messy and time-consuming, but works in a pinch. You could of course do it the lazy way and just roll out lengths and cut them up. The taste will be just as good, even if they won’t look quite as pretty. Have a great day everyone, and give these a try if you have a chance! Start off by preheating your oven to 200 degrees Celsius (180 fan). Stir together the oil, water, and sugar until well blended. Mix together the rest of the ingredients (chopped almonds, flour, vanilla sugar, baking powder, and baking soda). Pour in the oil, sugar, and water mixture and mix well to form a dough. Form the bachkoutou in lengths of about 10cm. The easiest ways are either using a meat grinder with a star output plate, pushing the dough manually through a large piping nozzle, or simply rolling lengths and cutting to size. Place the lengths onto an oiled baking sheet, allowing a little room for spread between each one, and then bake in the oven for about 10-15 minutes, until a pale golden colour. Remove, and allow to cool on the tray before enjoying. Ovens are finicky beasts. I would recommend only baking a few bachkoutou at a time and cooling them between each batch, until you're able to find the ideal temperature and time combination! Hi everyone, I promised you photos today and I won’t disappoint, but a disclaimer first. The weather yesterday was filthy. Overcast and grey and rain spilling down around us. It was not good photo-taking weather, I can tell you that right now, but I had said I’d show you some and so I diligently stood there under my umbrella trying to snap interesting looking things! Anyway – you have been warned, so now on to the main post! If you think of Paris and water-ways, I’m guessing most people think of the river Seine – understandably so, since it’s the giant river which runs right through the city, carving it in two, but did you also know that Paris has canals too? Not just one either, but three, as well as a large artificial lake. 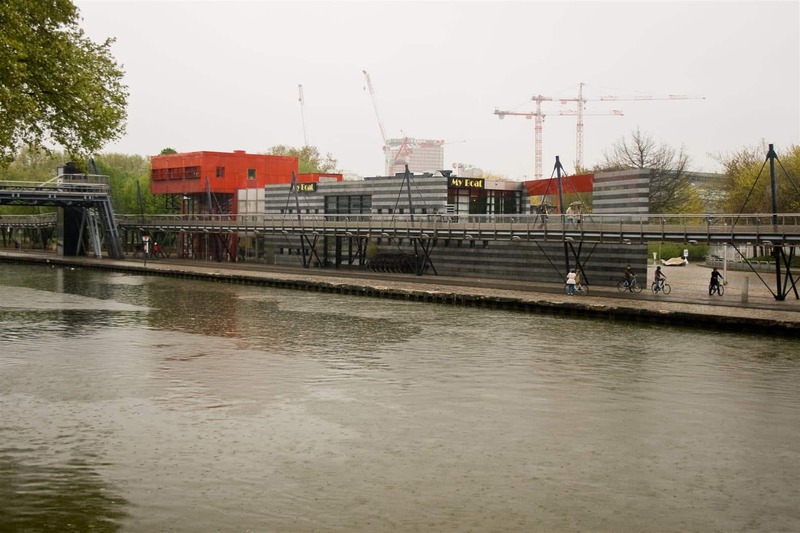 The Canal Saint-Denis, Canal de l’Ourcq, Canal Saint-Martin and Bassin de la Villette accordingly. 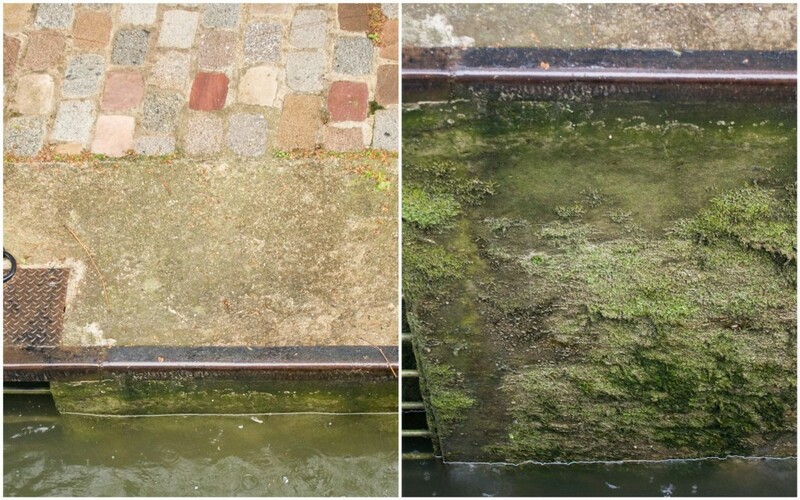 Construction of these canals was ordered by Napoléon Bonaparte in 1802 with the goals of creating both improved shipping routes and a better method of providing fresh water to Paris to cope with the demand from a growing population. The Canal Saint-Martin actually joins up with the Seine in the centre of Paris eventually and these days makes for a pleasant boat-trip. I’ve been on this tour before but it’s a very fun trip and if you find yourself in Paris I would recommend it. You start off in the north-east of Paris, near the Porte de Pantin – famous for the concert halls and exhibition centres in the area. The tour leaves at 14:30 which means we have time for a lunch first at the restaurant by the canal (this part of the canal is the Canal de l’Ourcq) – a restaurant called My Boat, which is actually shapped like a boat and for some reason has Titanic showing on a big TV screen non-stop (it was showing the movie “Titanic” last time I was there too!). Despite the odd choice in lunch-time entertainment the food is excellent however, and hot, which was good because the boat we took on the canal was packed – I’d never seen it so busy before. – and as such, in order to enjoy anything, I had to lurk out on the top deck in the rain and wind! All that did put a bit of a dampener on the trip – I’d advise going on the morning boat, which leaves from outside the Musée d’Orsay (on the river Seine) and goes to here (while this trip does the reverse journey). 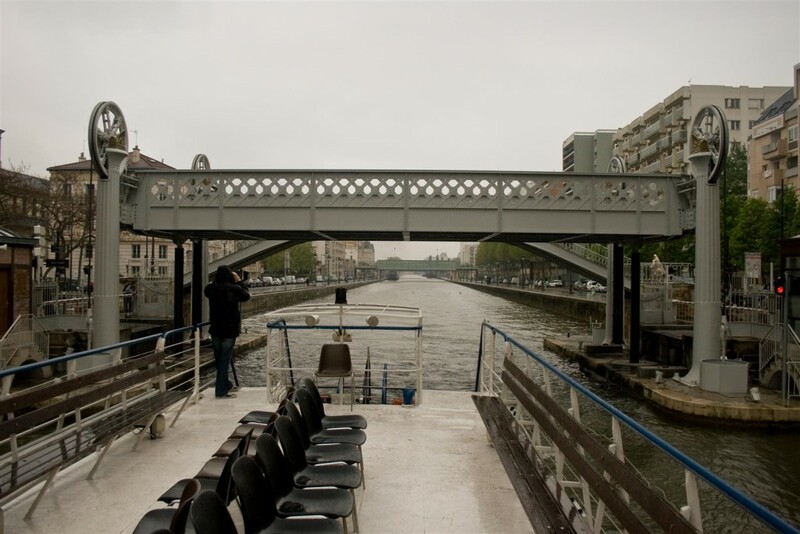 During the trip you go under all manner of tunnels and bridges – ones which swing out, ones which lift – this one, just before the Bassin de la Villette, lifts entirely up into the air – road and all – to allow the boat to pass underneath. 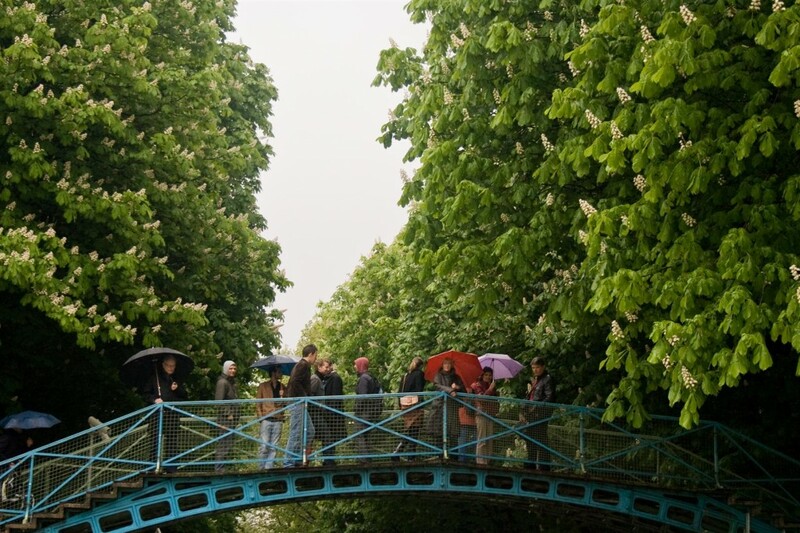 At the end of the “Bassin”, the largest artificial lake in Paris, you join up with the canal Saint-Martin, by going through a double lock. Even though I know these days exactly how they work, I still find locks so cool – the very idea of taking a boat “downhill” (or even uphill) is amazingly clever and you pass through plenty of these locks on your journey, as the final destination – the Seine – is about 27 metres lower than the canals – each lock takes you down about 3 metres and it’s fun to watch the water “disappearing” as the boat sinks down lower and lower. 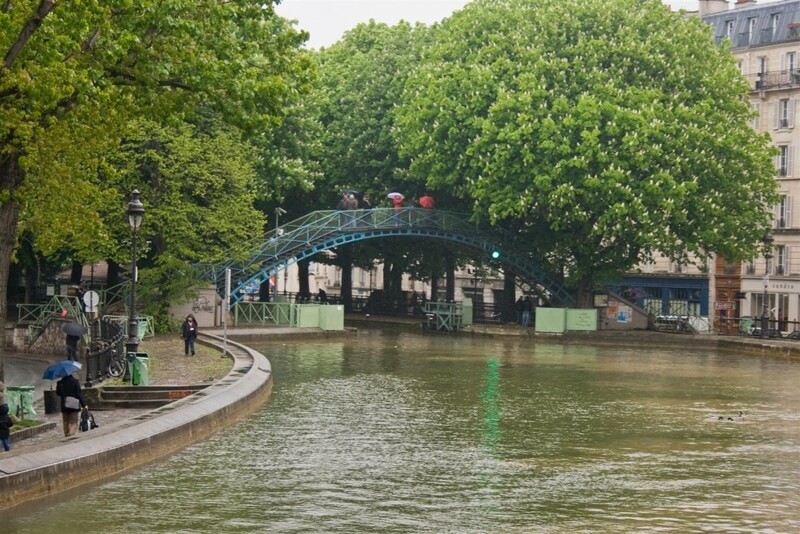 At one point we reach the Canal Saint-Martin’s most famous lock – shown in the 2001 film Amélie (which if you’ve never seen, by the way, you really should!) which also one of the last two locks before you enter the long tunnel which runs under Boulevard Richard Lenoir, all the way out to Place de la Bastille before going through the Port de l’Arsenal, where people park up their rather fancy boats, going through one more lock, and finally entering the river Seine, were you go past the Ile St-Louis, Notre Dame de Paris, the Conciergerie and other landmarks before finally arriving back at the Musée d’Orsay. The trip takes 2.5 hours and is reasonably priced at €19 for adults, €12 for children. You get to see a whole lot of places you might never have known existed (like the huge tunnel under Boulevard Richard Lenoir for example) and if the weather is fine it’s a very enjoyable way to spend an afternoon. The trip is narrated in French and English and occasionally you might even get a guide who brings along a clarinet and sits at the front of the boat playing mournful clarinet songs as the boat goes through the long tunnel! 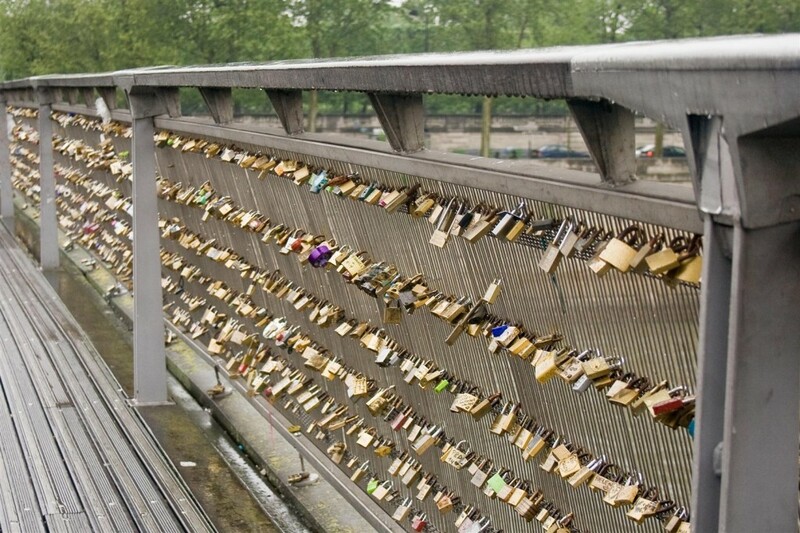 Nowadays the bridge has become a hotspot for couples who attach a padlock to the railing and throw the key into the river below. I’m guessing at some point someone got confused about which bridge they were on, or wanted to start a new trend, because it seems now the Passerelle Solférino next to the Musée d’Orsay is covered with padlocks too… like literally a padlock on every spare bit of iron railing! I hope you’re all having a great Sunday – today I’m thanking Jean from Delightful Repast for inspiring me to make tortillas and what better ingredient to use than some of my new flour, but which one? Well, I thought about this for a bit and then decided to go for the quinoa flour. I’ve never used quinoa flour before and wasn’t sure what to expect. My first couple of attempts were not too great. The dough discs were impossible to pick up, kept sticking and tearing. Well, I’ve fixed this now and the result was good. A soft bread with the typical brown marks frmo the pan dotted over the service. If you can imagine the smell of uncooked quinoa – the flavour is identical to this. 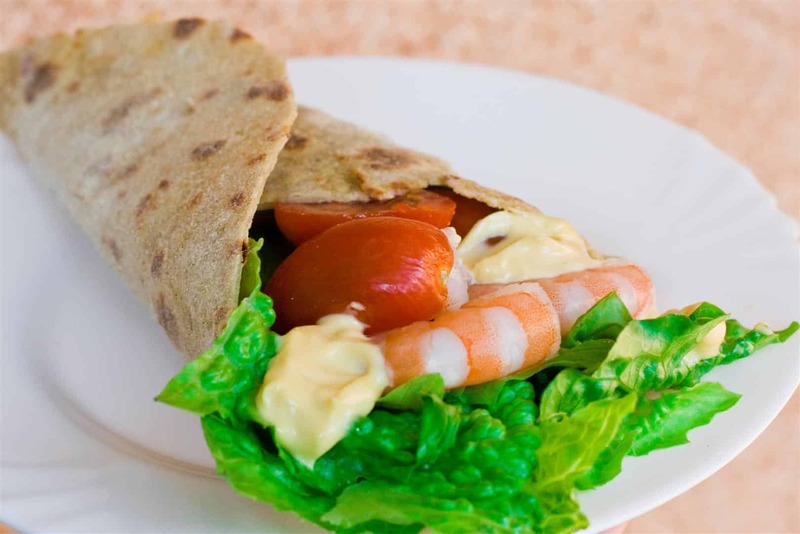 I found that it could be a touch overpowering, so you’ll need to ensure that you wrap them around something sufficiently strongly flavoured to balance out the taste. As per my recent cupcakes, these tortillas are gluten-free. Follow my tips of “roll, reform, roll again” carefully in case you encounter any difficulties with the rolling of the dough, and enjoy :). Have a wonderful week – I’ll be back in the week at some point with something new! A delicious gluten-free alternative to the traditional tortilla. Start off by mixing the quinoa flour with half of the oil and salt in a bowl. When blended well, pour over the hot water, adding a little extra if necessary and combine to form a dough. Knead gently for a few minutes before covering with the rest of the oil and allowing to stand for about 10 minutes. Divide the dough into roughly 10 equally sized pieces. Shape the pieces into small balls between your hands and then, on a heavily floured board, roll each piece into a rough circle. If you find the dough seems very fragile, immediately push it back together again into a dough and then make the ball again before rolling out carefully once more, being sure it forms a good circle. Repeat until all discs are cut like this. Heat a large frying pan on the stove. You will not need oil! 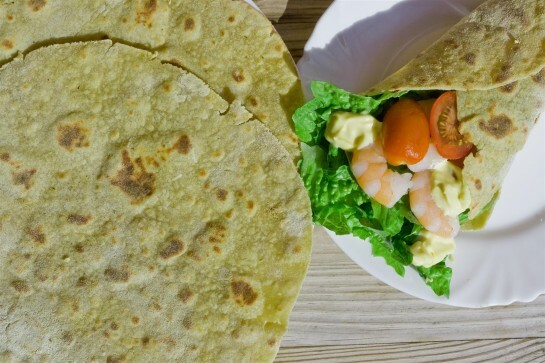 Transfer in the tortilla when the pan is very hot. Cook the tortillas on each side, for about 60 seconds or so, depending on how hot the pan is, until you have this kind of "patchy brown" effect, before flipping and cooking the other side. Keep the breads warm and humid until you plan on using them and enjoy!